Why do you do it? You have to be able to answer that question. Is it to help you deal with anxiety and stress? It may be hard for you to admit that you have a drinking or smoking habit, but you can't change what you don't acknowledge. "What purpose does the behavior serve for you? If you're an alcoholic, you're not just drinking because you're thirsty. Admit to yourself: 'I'm medicating myself for anxiety, depression and pain. It numbs me to life.'" 2) Think rational thoughts instead of denial. You understand at a conscious level, at an intellectual level that your addiction is unhealthy, yet you continue and this perplexes you. "If you're in denial about it, if you're minimizing it, if you're trivializing it, if you're conning yourself about it, then you'll never get where you need to be." If you can't get through the day without a shot of vodka, you may be medicating yourself for anxiety, depression or pain. You may need to count on others to help you think rationally. 3) Use alternative coping skills. People don't break bad habits; they replace them with new ones. Recognize that you get a reward from smoking or drinking. "It calms you. It takes your anxiety away. It lifts your spirits. It numbs you to the pain of your life. If I take that away from you and then don't put anything in its place, then you're just there stripped of your coping mechanisms and you're going to go back to what you were doing before." Some alternative techniques to consider to replace your addiction are breathing exercises or relaxation techniques. 4) Identify your danger zones. A danger zone can be a particular time of day or your reaction to a particular circumstance. There are times that you're more prone to indulge in your habit than others. Recognize what those times are, and do something that is incompatible with the addiction you're trying to break. For example, if you have the urge to light up during your 3 p.m. break at work, take that time to do your breathing or relaxation exercises instead. "If you get through that two or three moments of impulse, I promise you it will go away." You don't have to be strong and powerful all day long every day. You just need to recognize your danger zones, and do something incompatible with your addiction. 5) Make lifestyle changes. "It's not willpower, it's programming," You have to set your life up for success if you're going to break your addiction. 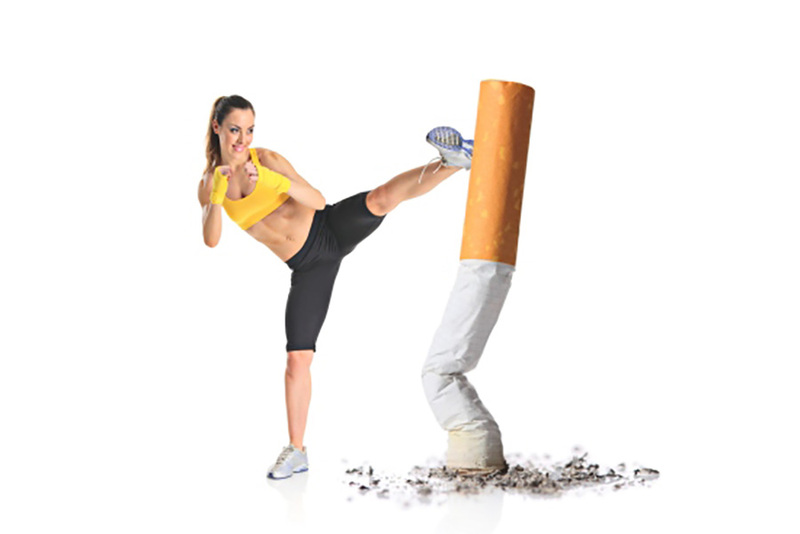 If you're trying to stop smoking or drinking, try simple things like not carrying money for cigarette vending machines or cleaning your cupboards of alcoholic beverages. You may have to change the places you frequent, what you do for fun and whom you hang out with. If you are a computer junkie, remove the computer from your house. The best way to stop an addiction is to not have access to it. 6) Be accountable and have a support system. Being accountable to someone means that that person will not only support you, but will give you the kick in the rear that you need when it gets tough and tell you the truth when you're kidding yourself. Get your family and friends involved in your efforts to kick the habit. You need to find a community that supports you during this time and embraces your decision to be healthier. You may also need to seek treatment or check into a rehabilitative program. 7) Reward yourself.Overcoming an addiction can be very difficult, but it can be done. When you see yourself making progress, even baby steps, you have to motivate yourself to keep going. Give yourself credit. Reward yourself for every step you make, starting with admitting that you have a problem and asking for help.